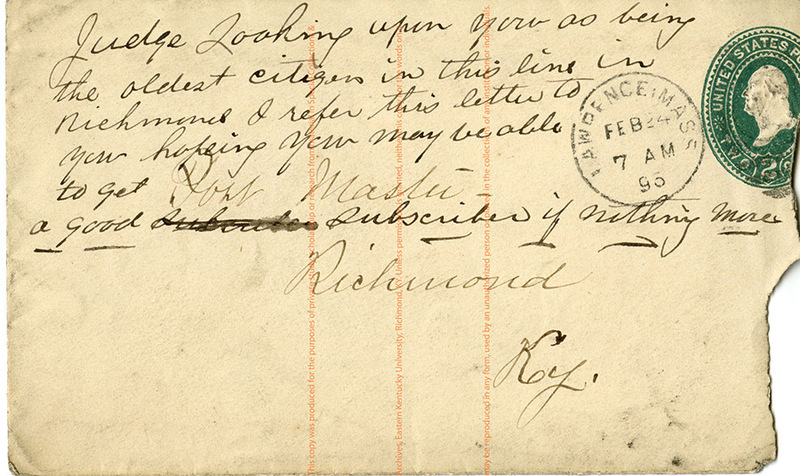 Originally addressed to the Post Master of Richmond, this letter was forwarded to Judge Tipton with a note commenting that at the least Tipton may acquire another Climax subscriber. 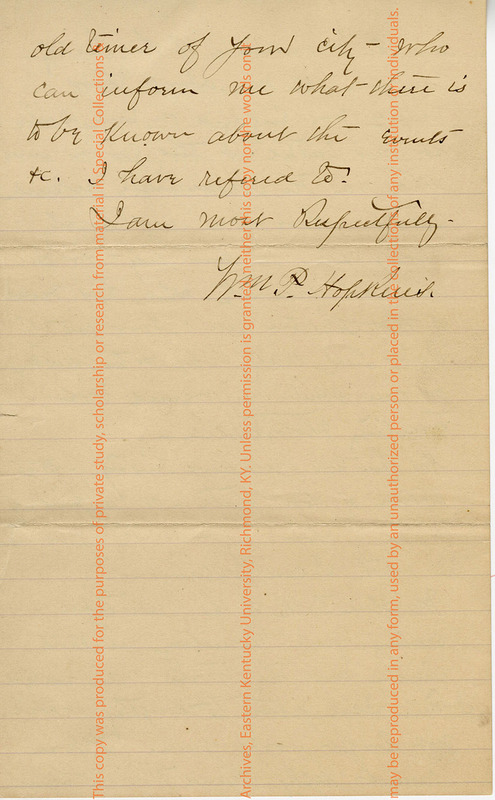 The attachment, which is the actual letter, requests information regarding the 7th Kentucky Volunteers' troop movements during May, 1863, as well as the details of a Civil War battle that took place shortly before Hopkins' arrival to the Richmond area. An interesting point of note is a comment he makes about a woman waving an American flag in their Confederate faces during a march through Richmond. Lawrence Mass. Feb. 24, 1896. Dear Sir. In 1863, I was a member of the 7th R.I. Inftry Vols. which tarried several days in a grove of walnuts a short distance south or south east of your beautiful town. 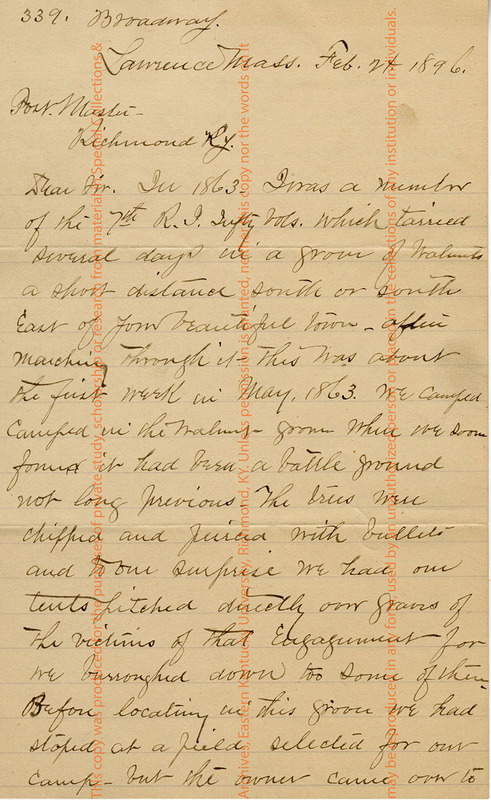 After marching through it – this was about the first week in May, 1863. We camped. Camped in the walnut grove where we soon found it had been a battle ground not long previous. The trees were chipped and pierced with bullets and to our surprise we had our tents pitched directly on graves of the victims of that engagement for we burroughed [sic] down too [sic] some of them. Before locating in this grove we had stayed at a field selected for our camp, but the owner came over to us saying he wanted to cultivate that land and asked us to locate in the grove which we did the next morning. Remaining some over a week. We came from Winchester to Richmond, and upon our entrance to your city, we brushed up our uniforms, took a good long rest, unfurled our colors, and started through with band playing and colors flying. Quite a sensation was created by some lady inhabitant appearing on the upper porch of a residence and waved a good sized U.S. flag to us as we marched past and cheered here, and there was considerable talk about this lady’s boldness at that time. 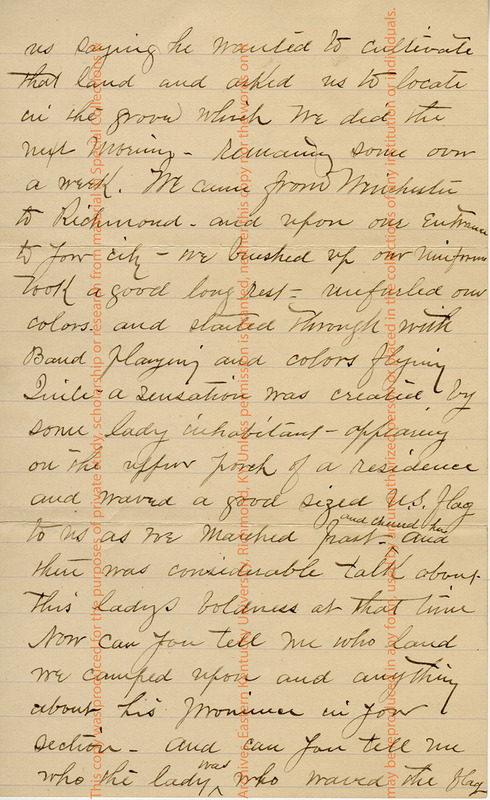 Now can you tell me who [sic] land we camped upon and anything about his prominence in your section, and can you tell me who the lady was who waved the flag and the prominence of her family. Can you tell me about how many was engaged on each side at this battle at this grove and who was the commander on each side. Have you any local photographer in your city, or one in your vicinity who has views of that section and your city of Paint Lick creek (why was this called so) or can some be procured by some traveling photographer. Has there ever been any history of that section of your state, or a part of it, or of your city. Anything about it which I can obtain. We often talk of the beautiful scenery. Fine country in that region and the towns we visited. I fear I am getting to [sic] lengthy so will not longer worry you. If you cannot reply hand this to some old timer of your city who can inform me what there is to be known about the events &c. I have referred to. 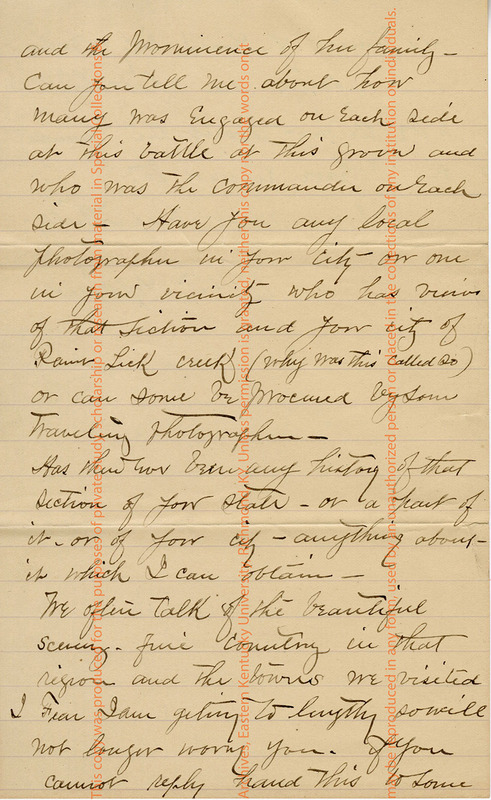 “Letter from William P. Hopkins to French Tipton,” Digital Collections, accessed April 23, 2019, https://digitalcollections.eku.edu/items/show/26434.